Get my recipe for garlicky kale salad with a tahini dressing. This recipe was inspired by the Whole Foods salad bar and it’s absolutely delicious! I’ll be the first to admit that I’m semi-addicted to the Whole Foods salad bar. Of course, I have some favorite items on the bar — one being the Cracklin’ Cauliflower, which I’ve already recreated at home and the second is the garlicky kale salad. After reading the ingredient list for the garlicky kale salad at the bar (shh… here’s a little secret — all items on the bar have an ingredient list posted) I decided to make my own variation at home. I knew the ingredients, but didn’t know the exact measurements so it took a little trial and error. I’ve made it several times now and I think it’s pretty spot on! You might try my Zesty Tahini Dressing with it. You can find that recipe and more with my list of healthy homemade salad dressings. The recipe for Whole Foods garlicky kale! This is the best kale salad! 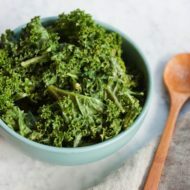 Break or cut kale into bite size pieces and place in a large bowl. Puree all ingredients except kale and sesame seeds in a blender or food processor to blend the dressing. Pour dressing over kale and massage into the kale with your hands until all pieces of kale are coated. Let the salad sit in the fridge for an hour or so to marinate. 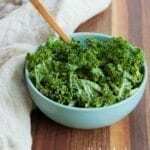 You can skip this step if you need to eat right away, but allowing some time to marinate will wilt the kale a bit and make it a little more palatable – particularly for those who are skeptical of eating raw kale. Sprinkle on some sesame seeds before serving if so desired. Do you have any Whole Foods salad/hot bar favorites? Have you ever recreated your favorite store-bought or restaurant dishes at home? Thanks for the recipe! I just bought a bunch of kale (my first time!) and was wondering how to go about eating it, haha. I’m obsessed with the Whole Food hot bar as well. Fortunately for my wallet, I no longer live within walking distance of a Whole Foods. I really like their Indian food selections, but I’ve never tried to recreate any of their food at home. I probably should though since it would be much cheaper than paying by the pound. I too am addicted to the Whole Foods hot bar…I go there almost everyday that I don’t bring my lunch to work! I love it so much that I walk a mile uphill BOTH WAYS! Actually, I just walk through Beacon Hill…but I like to pretend that I’m foraging for my lunch because I walk so far! I love when they have Mexican food with that giant trough of guacamole! I am also addicted to the WF’s salad bar. I stop by on my way to work every Wednesday to do a little grocery shopping and make a crazy combo in the salad bar for lunch! It’s so good, except for the few days when they don’t have kale! Mmm I love whole food’s salad bar as well! The only problem is, I can never stop myself from loading up… which means paying more than $10 for a salad bar meal. So, I try to stick to Martin’s. I’ve never eaten from a salad bar OR had kale. I think I need to remedy these things as soon as possible! ahh I do that all the time with the food bars I love recreating recipes. I cant wait to try this one out I LOVE their kale @ whole foods yum! No joke-I’d live at WF if I could! The Whole Foods Hot Bar is a dangerous place for me to visit…good thing Whole Foods is few and far between in Canada…a blessing to my wallet! I always wonder, “how did I just spend $17 on salad?” But then I forget about that small detail and dig in! I found your blog (and this blogpost) by typing “garlicky kale whole foods” into my Google search box…and here you are! The garlicky kale is one of my favorite things ever, I’ve been known to fill up a huge container and eat it for lunch! Sadly, they didn’t have it on my last visit so I’m so glad I found your recipe 🙂 I’m off to Whole Foods right now to buy the ingredients! Thanks! I just made this recipe and thanks so much for posting it. I’m in the DC area and I went to three WFs and for some reason no one what the measurements and proportions are for the Garlicky Kale Salad. You can tweak this to suit your tastes…I tripled the recipe because I want to use the dressing on my raw broccoli as well. I used tamari (soy sauce) instead of the liquid amino acids and it was a bit saltier than the store version. I also added extra virgin olive oil because a few other copy cat recipes recommend EEVO. I toned down the tahini when I increased the recipe and increased the lemon juice and garlic. Thanks so much for sharing your version of the recipe Crystal! How much kale did you use? We love this recipe! The only change we made was substituting a tablespoon of miso paste for the nutritional yeast. I just got the recipe tonight from the Whole foods cook. They told me to use the kale raw and the recipe was for much larger amounts. It started with 1/2 lb of garlic roasted! I was told Whole Foods keeps a recipe book of all their recipes in case anyone wants one. The kale is this recipe is raw, I just recommend washing it. 🙂 This recipe might now be identical to the Whole Foods recipe because I have modified the ingredient amounts for at-home prep. Whole Foods makes recipes is large quantities because they are serving so many people. I made a double batch of this for Thanksgiving this past weekend, and my family went nuts for it! Thanks for the recipe. Now I don’t have to dish out so much money at the Whole Foods salad bar!! So glad you enjoyed the kale salad Melody!! Love your recipe! My sister found this a few months ago and it’s become a staple for us both! Actually your variation tastes better than WF! I’m blogging about it tonight and I’ll add the link up to your blog. Thank you for sharing this! just made this for lunch for my boyfriend and i – it was delicious!! although – DUH – forgot to add the nutritional yeast!!! i’m sure that addition will make the dressing EVEN more yummy but good to know if i don’t have it on hand it is still a tasty salad. thanks for re-creating! This is wonderful! My girlfriend moved here (the uk) from the US, and the one thing she misses the most is the wholefoods salad bar – and this was her favourite thing on it. I just followed the recipe exactly, and it’s indistinguishable! I really can’t thank you enough – we’ll be eating kale now until it comes out of our ears. THANK YOU! I am desperately in love with this salad and on a whim went searching for it. And here it is. Great ingredients. Can’t wait to make some at home! I hope you love it Natalia!! Fabulous recipe! I made it yesterday for a potluck and everyone wanted the recipe so I forwarded the link. It is as good or better as the one at Whole Foods. Great job orchestrating the flavors. Thanks! So glad you liked it Andrea!! I am so thankful to find this recipe!! This is my favorite thing at wf, which is not real close to my house. Nest to find the yummy woodland mushroom salad I got there yesterday. Brittany – thanks so much for your garlicky kale recipe. I have been going into WF for lunch 3-4 times a week eating their garlicky kale. I looked at your recipe about 20 times on this website before I actually tried it. I’m a “buy it pre-made” kinda guy, but I was inspired to save the $$$ I’ve been paying to WF. Your recipe worked great. My food processor did not grab all the tahini, but I stuck some of the kale pieces in the food processor and wiped all the good stuff flavor off the bottom and sides. Thank you so much. It looks like a have a lot of dressing on the bottom of my bowl. When I eat up the kale for lunch (I see it as 2 lunches worth), I’m going to try to reuse the remaining dressing. I used to make this salad all the time when I worked for the company. Try this dip, it tastes super indulgent and perfect with the 365 corn tortillas (with no oil) baked with nutritional yeast. Yum! That dip looks super tasty – I’ll have to put it on my to-make list! Thank you-I crave this kale and was trying to figure out how to make it. I’m not sure how close yours is to the recipe. Perhaps it’s the same. BUT it is way better, in my opinion. Again, so many thanks!!! I am 3 hours away from nearest WF and always look for this when I make the rare trip to one. Thanks for posting this fantastic recipe! I made it last night, tripled the batch because I love it so much. 😀 So savory! I added some chopped asparagus (lightly broiled so still a little crunchy) and some halved cherry tomatoes to the kale salad- didn’t want to add anything that would detract from the dressing! I will be sharing this at a potluck tomorrow, thanks again! I absolutely loved eating this salad at Whole Foods. I made a trip there almost everyday just for this salad, and now I can make it myself and share with friends. i am vegetarian and i feel all of your article is nice and i’ll follow your site for ever. I will be trying the recipe for the Garlicky Kale! thanks for sharing how to make it palatable too!! OMG I am so glad I came across your website and you showed me a way to make Kale. I was starting to wonder if only juicing it was good. I just made this for my lunch today and it is so delicious! Much better than the Whole Foods version! Love this way to cook kale. Just stumpled onto your blog and it is very inspiring. I have been looking for healthy vegetarian recipes that have a good flavor and spices and yours are great. Hey, try this recipe in the dehydrator or in the oven on low temp until crispy: make some kale CHIPS. Sounds like it would work. Just throw the seeds in the blender with the rest of the dressing ingredients and use a bit more kale than the recipe calls for. Did my first batch of kale chips yesterday and this sounds like a terrific marinate. YUMMMMMMM. Also try collards or beet greens this way. Salad for the road! WOW! … I made the recipe exactly as you posted and it is wonderful. I have been making kale salad with various vinaigrettes and all are good with the vinegar “cooking” the kale a bit, but this is the absolute best. I add seeds, nuts, cheese, even a bit of bacon or hard boiled egg or chicken to up the protein for a “meal” salad. Oh…I also added some chard. I am nowhere near a Whole Foods (northwest MT), but I have a wonderful CSA down the road so my kale and chard is organic and right outta’ the ground :)! Found much to like on your blog – thanks for sharing. I just made some tahini +braggs aminos+ tamari kale chips and made such a huuuuge bage.. unfortunately they are almost gone after just 1 day.. 🙁 i am so addicted to those babies! garlicky ones look amazing too!! i have to watch out not to overeat on them, i feel like they can get a bit difficult to digest. This recipe is amazing! The first time I made it I thought it was pretty good. Two days later I had the leftovers and…Wow! I make it all the time now (2x’s a week usually)! Thank YOU!!!! This is so delicious. I didn’t have any apple cider vinegar on hand, so I used balsamic vinegar and it tasted awesome still. I crave this kale salad so much and I really appreciate you taking the time to write this out! So glad you like it Ashlee! You can also buy the zesty tahini sauce from the produce department. That is what they use for the garlicky kale on the bar. I asked and the guy walked me right to it. (I didn’t read all the comments. Apologize if this was also mentioned). Fantastic! I often try to make at home versions of prepared food I’ve enjoyed. Sometimes I luck out and can get a recipe from a chef, a list of ingredients or have the great good luck of guesstimating with good results. Even with recipes and lists of ingredients it can become a long-term process, trying and adjusting over time. 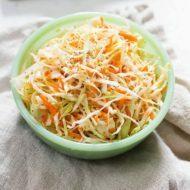 I’ve been working on a Burmese green papaya salad for a couple of years (very different than Thai green papaya salad which is much easier to duplicate IMHO). My attempts at Burmese salad are tasty, but short of the OMG goodness of Mandalay’s green papaya salad (Mandalay a most highly recommended home-style Burmese restaurant in Silver Spring MD). Anyway just saying I really appreciate finding this spot-on recipe that worked first time. Thank-You sooo much for posting the result of your efforts. This salad is addicting! This is better than the Whole Foods salad bar version. I could literally eat this twice a day, 7 days a week and not get tired of it. I tried to make it more of a meal, so I added some candied-walnuts, a little bit of grilled chicken and grape tomatoes. It is delicious by itself, though. You rock! Just whipped up a batch in my blender. Had to buy Bragg’s and nutritional yeast but because I am so enamored of the kale salad it was motivated to try. Oh wow – this is delish!! I hate to be WF-blasphemous but I like your recipe better! My daughter and I were eating it out of the serving bowl! I had my first garlic kale while on vacation in Hawaii at a Whole Foods in Kailua. It was so delicious after a day at the beach and I found myself thinking about it well after the stop. I live in Boulder and while we have Whole Foods I haven’t seen this salad. Thanks to you I am able to have this delicious salad whenever I want. Maholo! You nailed it! I love this dressing and use it everywhere…it’s sooooo good. It feels so decadent and it bursts with flavor. This has become a staple in my fridge. Hi, I am making this for the first time.. I’m a newbie when it comes to using yeast. Do I just use active dry yeast? Made this tonight and it was really tasty. It will definitely be part of my Vegan diet. Thanks for the great recipe. Awesome. So glad you enjoyed it John! Love this dressing, i am hooked on it. I only had half the Tahini one day, so i substituted some natural Peanut Butter and added some Chili Flakes. Turned out great! I had just had this at Whole Foods and came home craving more of it! Found your recipe and despite having it, forgot to add the nutritional yeast. I. AM. BLONDE. It didn’t taste quite right (ya think?!) so I added a little more tahini and garlic and I had some fresh tumeric on hand, which i love, and blended in a little nub of that. It was very good, but I will add the yeast next time! Made it again tonight, this time with ALL the ingredients. LOL! Awesome! Thank you! As Val mentioned, you nailed it!! I had this for the first time at Whole Foods last week and came home and immediately looked up a copycat recipe because it’s SO good. Thanks for all the cash you’re going to save me by making it at home! Guys, if you live near a WholeFoods, this dressing is readily available under the WholeFoods Label. It is a No-Oil dressing and it is named, “Zasty Tahini”. The salad is also available in WholeFoods’ “Cold Bar” under the same name as above. Brittany, thank you for such a good recipie. There is only one problem….now I’m addicted 🙂 . I make it at least once a week. When I first tried this salad at whole foods I became a fan. You did an excellent job enhancing it. Now I’m a bigger fan. Thanks so much for taking the time to figure it all out and share! I’m in the came-home-from-Whole-Foods-and-tried-their-version-for-the-first-time-and-knew-I-had-to-make-it-myself camp. I’d never have had the patience. What a GREAT recipe/dressing! I’m so excited to find this! I’m also addicted to the Whole Foods salad bar – especially this dish. I’ve been wondering how to make it and my own experiments haven’t been very successful. As soon as I find nutritional yeast, I’m going to give this a try! Thanks so much! Oh, my other personal favorite is the beets with orange juice. I have no idea how to make it. Do you have a recipe for this? Delicious! Thank you for posting this! Although I don’t know what the whole foods version tastes like, I walked past it in the store, smelled it, said “oh my goodness that looks amazing!” and took a picture of the recipe hoping someone would have tried it out. I added some sliced almonds to it, but the dressing itself is very very yummy!! i just made this. its sooo good. And will save me money at whole foods. Thanks for sharing. Just wanted to let you know i made this the other day and it was fantastic. Thank you for a great recipe! Delicious! I tried it with 1 tbsp. of soy instead of 2, perfect! Thank you so much for posting this!! I have recreated their triple squash soup and I was so happy to find another one recreated. I think I have no become obsessed with your blog so thanks! lol we are now having this with our dinner tonight!! You’re welcome. I’m glad you enjoyed it. I haven’t had the triple squash soup! Is the recipe on your blog? Hi! Yes here is the recipe on my blog! Thabk God you did this. I am addicted and have eaten this 4 times in the past week. I will be making this soon!!! 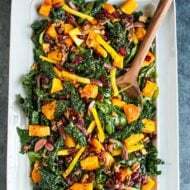 My husband and I love this recipe, and even our 20 month old daughter enjoys eating kale this way! Thanks for sharing. Thank you so much for this recipe! Whole Foods recently started selling rabbit meat, and as the caretaker of five companion rabbits (one of whom is a “meat” breed and is the sweetest most intelligent of them), I cannot shop there anymore. Now I can enjoy my favorite WF salad bar item without supporting a store that sells pets in their meat case!! You should try this dressing on cucumbers, tomatoes & onions! Truly a versitile dressing – it’s even good on rice! Beth Chow – “pets” is totally a matter of opinion though. In some countries they eat cat, dog, horse… Rabbits are a commonly hunted animal in the US – along with deer, duck, goose, pheasant – would you stop shopping somwhere because those are sold? Do you buy eggs? Those are potential chickens, which ALOT of people have as pets. Ever watch a child raise a cow or a sheep? They are easily pets as well. I’m not arguing for the sake of arguing – I just don’t understand the reasons that some people pick a single particular thing to boycott someplace over. Just stumbled across this at WF the other day, and it was so good. I love how they display the ingredients for every item on the bar. This recipe is spot on delicious!! I minced the garlic but didn’t puree with the other ingredients and it was perfect. Thanks for posting! We love making this dressing and almost always keep a jar in the fridge. However, when we inquired about it at WF originally, they said they make it with roasted garlic, so that’s how we make it & it’s delish! Thanks for posting. My recipe is very similar to yours and it was based off of Foodbabe’s Tahini dressing. I also added some cumin, smokey paprika and coconut nectar to balance out all the acid and pungent flavors like garlic. I use a mixture of lacinato kale and either romaine or red romaine or any other leafy greens, cut up cucumbers, some cherry tomatoes and a sprinkling of roasted chopped almonds and hemp seeds on top! It is out of this world! When I first started eating kale, I was like yuck, how can anyone like this stuff. Well I go to the farmer’s market and I get like 3 big bunches of kale and I make smoothies, green juice and my salads all week long. It just gives me so much energy and I feel like wow after I eat it. Hope everyone feels the same way! 🙂 God Bless everyone with good health! I love the garlicky kale at WF so this is exciting! But can you confirm they list nutritional yeast as an ingredient? I really don’t care for the taste of it.. and there’s a good amount in this recipe. Hoping I can substitute with something else. But then again, if they have used it… I must not mind! I love the WF garlicky Kale as well, and had shot a photo of the window tag as well for prep in making it and thought I’d do a search before I began and found you. This tastes so good-I upped the garlic another teaspoon because I just love it so much. Thanks for the recipe and the R&D ! This is a great recipe for one of my favorite dishes at whole foods….however I have discovered what you can actually buy and what I have been told they actually use this one item and eliminate all the above ingredients because they are in this one whole foods product. Found in the cold section and called “GARLIC TAHINI DRESSING” by whole foods “health starts here”. Yup! I’ve mentioned this dressing several times in other posts. It’s awesome when you just want to buy it rather than taking the time to make your own! Hooray! I’m so glad that you liked it. It’s definitely one of my favorite recipes. Your recipe was PERFECT! Thank you so much for sharing it! I don’t have a whole foods where I live and when in holiday found this dish at the salad bar and basically stocked my entire box up with this as its so tasty. Just made it for the first time myself and it’s amazing!!! I added a tad more garlic but I do love garlic and but of water plus the cider vinegar. Thanks so much for posting this recipie. It’s garlic kale party time at my house for the foreseeable future! Thank you for this! I only just discovered WH’s kale salad last weekend and am completely in love. Amazing that I can now recreate it! Thanks. I also love this salad and am excited to try your recipe. I thought I hated kale until I tried the WF version. Do you know which variety of kale they use? When I’ve bought kale in the past it has been strong and bitter, but the kale WF uses for this salad is very mild and lettuce-like. I hope you enjoy the recipe. I think they use regular curly kale or red Russian kale. Red Russian is sweeter and milder than the other varieties. I can tell by the amount of replies how good this recipe is. 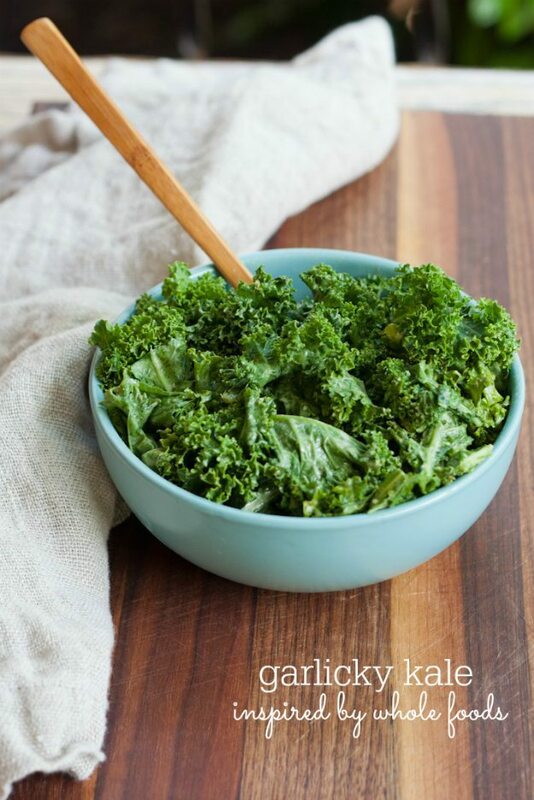 I love garlic kale and this recipe is great. I only changed it, by increasing the garlic and freezing the kale before adding the dressing. Incredible! I am not sure who loves this more, my husband or me. Making it again tonight. I love this recipe!! Does anybody know what nutritional yeast is and why it is necessary in this dressing? Can I skip this ingredient? Hi Jeanna. Nutritional yeast is a vegan seasoning that has a nutty, cheesy flavor. It’s an important part of the dressing. You can find nutritional yeast in the bulk bin section on must natural grocery stores or in the natural/organic section of a regular grocery store (near the spices). If you can’t find it at your local grocery store you can always buy it Amazon: http://amzn.to/1SIXnha. Hi ,I am so thankful to find this recipe..! this is my favorite thing at wf, which is not real close to my house. So glad you liked the kale salad, Robin. Feel free to tweak the dressing based on your preferences. And yes, I’ve grown my own kale before and loved it! I need to plant some this summer. Brittany you are very talented in writing:) i am following this blog in around a year and i never stopped reading! Best article online, so many great tips both smart and creative! I enjoy your article very much, my sister also said that the blog will be the top! Thank you my friend, will wait for your next update! I am so glad I came across your website and you showed me a way to make Kale. I was starting to wonder if only juicing it was good. tanks a lot for learning Kale ………..
i would recommend this page to my friends …….. This is the BEST Kale Salad Ever! Thank you for creating & sharing this fantastic recipe with us! It looks like a delicious meal to give it a try. I also try. Incidentally, broccoli is one of the dietary dishes. I avoided making this cuz I didn’t wanna buy nutritional yeast but I finally did and it’s brilliant and perfect. I used soy sauce packets instead of amino acids cuz, you know, being cheap. This is so good! My local WF quit carrying it, it was expensive so ok with that. 🙂 I make this every week & triple the recipe. I use it as regular salad dressing & also put on veggies. I added few portions of mint to change the flavor, I know it wasn`t on the recipe 🙂 but it was a good idea indeed. So freaking delicious and easy to make too! Thank you! Question- How long will the salad w dressing keep in the fridge? Hoping for a few days. Hooray! So glad you like this recipe, Jen. The dressing should definitely last 3-4 days in the fridge. Enjoy! I love this recipe, have made it many times and referred others to it. I noticed that since you have added the video, the ingredients no longer “match”. The video says 2 Tbsp of nutritional yeast (vs 4 written) and 4 cloves of garlic (vs 2 written). I’m sticking with the written because I like those proportions. Just wondered why the disparity. receipt are so good but in by my self i like to use more lemon juice!